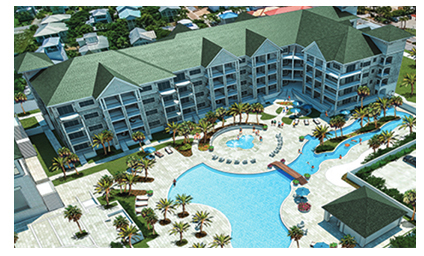 The Henderson Lofts is a 54-unit luxury residential condominium nestled inside the Henderson Beach Resort in Destin, Florida. All owners and vacationers will have access to the amenities offered by the Resort including pools, a lazy river, private beach access, onsite restaurants, luxurious spa, exercise facility, and covered parking deck. Spend the day exploring all 11.5 acres of the resort using complimentary bicycles or sunbathe on the large pool deck with a cold beverage in hand. Looking for ultimate relaxation? Enjoy a stress-relieving hot stone massage or revitalizing caviar facial at the The Henderson Spa. These condos will come in three floor plan styles: 1 bedroom/1 bath, 1 bedroom/2 bath, and 2 bedroom/2 bath and living areas will range from 750 to 1,073 square feet. Each unit will feature a full-equipped kitchen, washer & dryer, a bunk room for maximum sleep arrangements and most units will provide views overlooking the resort pool and deck. The prices of condos will range from the low $300,00s to upper $400,000s. The Henderson Lofts are adjacent to Henderson State Park, a renowned protected park spanning over 6,000 feet of pristine powder-white beaches and crystal blue waters. Close to the heart of Destin, the area offers plenty of activities and attractions to please the whole family including premium shopping centers, delicious Gulf coast cuisine, amusement parks, offshore fishing charters, and a number of championship golf courses. Looking for a little adventure? Take a drive down 30A and explore the charming beach towns of South Walton. The Henderson Lofts are guaranteed to provide the best vacation experience with its family-friendly resort atmosphere, exceptional amenity package, and close proximity to Florida's top beautiful beaches. Please let us know if you would like further information for The Henderson Lofts, other Destin condos for sale, homes, or real estate along the Gulf Coast or would like to schedule a private viewing by emailing info@condoinvestment.com. Visit our pre-construction condos page to view a list of current pre-construction developments in the area.